Recently we purchased a tall case with a face. The face lists Colonial Mfg. Co. in Zeeland, Michigan. 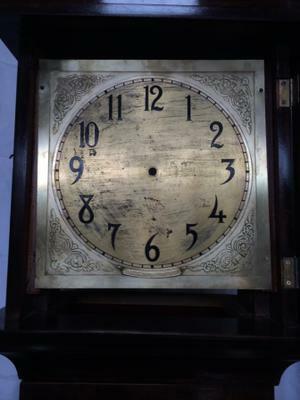 We are interested to find the approximate age of the case and we are also looking for replacement clock works. There are the initials in the inside top of the bonnet (Sa). The bonnet is 15” tall and 13 1/8 wide and 8 ¾ in deep. The waist measures 10 ¾ wide; 7 ½ “ deep and 38” tall. The case measures 88” tall from floor to top of finial and there is approximately 4’ 8” height to accommodate the weights and chains to drop from the works. 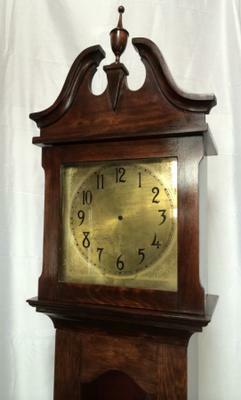 The case had been painted a mustard yellow, however, we sanded the finish off and found that it is cherry wood. The glass in both doors is slightly wavy, which is why we are so interested in getting an approximate date of manufacture. Any help you may give us will be greatly appreciated.